Provost Dan Rich and Susan Brynteson, May Morris Director of Libraries, officially launch UDs Institutional Repository with a ribbon-cutting ceremony. 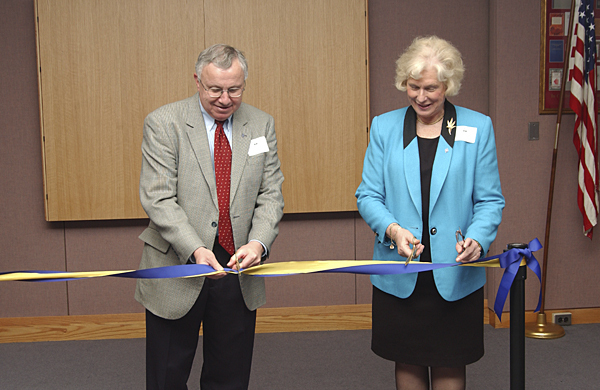 3:51 p.m., April 26, 2005--The UD Library Institutional Repository was officially launched at a gathering of deans, faculty and staff at a ribbon-cutting ceremony on April 18 at the Morris Library. The University of Delaware is one of the first universities in the nation to create an institutional repository for research and scholarship. The Institutional Repository is a library system that uses Dspace open-source software to make University of Delaware original research available in digital form, including technical reports, working papers, conference papers, images and more, through one interface. The repository is limited to materials for which the copyright is owned by the author or the University. A pilot program was put into place in 2004. At the event, Susan Brynteson, May Morris Director of Libraries, said the Institutional Repository provides one-stop shopping for access to UD research--storing, indexing, preserving and redistributing information. She thanked the Unidel Foundation for funding the development of the Institutional Repository and recognized the contributions of library colleagues Sandra Millard, assistant director for library public services; Gregg Silvis, assistant director for library computing systems; and William Simpson, assistant librarian. Provost Dan Rich thanked the faculty and other researchers who participated in the pilot project, as well as the library staff who created the repository. Fifteen different units contributed research to the pilot project, Rich said. The repository makes the products of UD research available to the world, he said. Four examples of the repository were shown on a screen--a comprehensive plan with texts and maps of Georgetown, a tissue collection for cancer research, historic maps of Delaware and the library of 40 years of research by UDs Disaster Research Center, which was recently digitized by the library staff. Rich encouraged deans and others to identify additional databases and research products that could be digitized for inclusion in the repository. Havidan Rodriguez, director of the Disaster Research Center, and Mary C. Farach-Carson, professor of biology, and others commented on the efficiency and effectiveness of placing research in the repository, which provides access to a wide range of research databases and products, including digital images. To visit the Institutional Repository, go to [http://dspace.udel.edu:8080/dspace/]. For more information about placing research in the Institutional Repository, contact Millard at (302) 831-2231 or [skm@udel.edu], Silvis at (302) 831-2231 or [gregg@udel.edu], Simpson at (302) 831-0188 or [wsimpson@udel.edu] or Brynteson at (302) 831-2231 or [susanb@udel.edu].